This price action indicator automates the detection of trend reversal breakout patterns; formed when price breaks above or below the key (support or resistance) level that marked the beginning of the opposite move. It generates trade signal with analytical entry, stop loss (SL) and take profit levels (TP1 and TP2). Been using this indicator for just few days. But so far signals are very accurate and R:R is very good also. I'll see how it goes for the time I have it rented. A WASTE OF MONEY IT DOES NOT WORK I DEMAND A REFUND. - Improved algorithms so that only high probability patterns are detected. - Option to take screenshots for all notifications added. 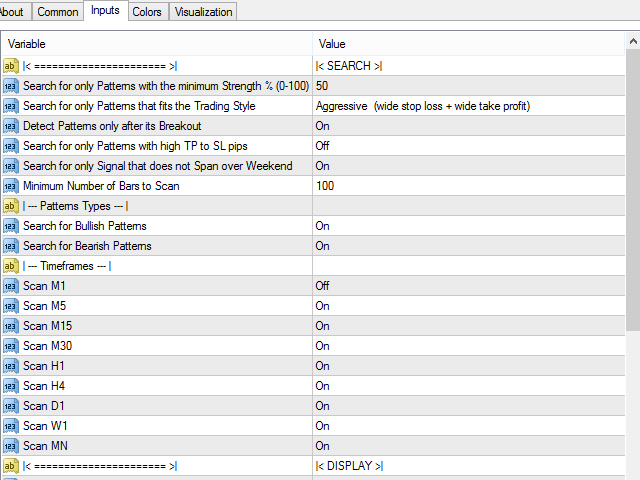 Screenshots will be saved to: MQL4/tester >Files > Trend Breakout Patterns Scanner (in the terminal menu select to view: 'File' -> 'Open Data Folder'). - Input setting 'Search for only Signal with Minimum TP to SL Pips Ratio of 1:1' default value changed to 'false'. - Option to add customized tag to notifications added. - Reward to Risk settings added. - Pattern quality setting was modified. - Improved take profit logic for better reward to risk ratio.